A landmark film in the careers of director Martin Scorsese and actor Robert De Niro, Mean Streets examines the gritty lives of assorted small-time criminals in New York's Little Italy. Filmed in unglamorous locations emphasizing desperate men pretending to be big-shots while scrounging for a better living, the film is all about characters dripping with unsatisfied bravado trying to create space for their pathetically over-inflated egos. Mean Streets just drops in on Charlie (Harvey Keitel) and his friend Johnny Boy (De Niro). Charlie is a low level hood doing the dirty work of collecting protection money from struggling businesses and trying to make his way up the crime family ladder, using the influence of his uncle Giovani (Cesare Danova). Johnny Boy is reckless and owes money all over town, including a large amount to local shark Michael (Richard Romanus). Charlie desperately tries to keep Johnny Boy out of trouble, but generally to no avail. Charlie is also in a relationship with Johnny Boy's cousin Teresa (Amy Robinson), who suffers from epilepsy. Tony (David Proval) is friends with Charlie and Johnny Boy, and runs the local bar where they all hang out. Michael is growing tired of Johnny Boy not making his debt payments, leading to an ugly, unavoidable confrontation. Mean Streets was the beginning of successful career-long collaboration between Scorsese and De Niro, which would include classics like Taxi Driver, New York, New York, Raging Bull, and GoodFellas, with New York City frequently the third point in the creative triangle. In Mean Streets, Scorsese brings out of De Niro a performance of doomed impetuousness, more jovial but not any less intense than his trademark future starring roles. Harvey Keitel actually has the leading role as Charlie, but he is eclipsed by De Niro's Johnny Boy and Richard Romanus as the slimy but steely Michael. Keitel would rarely play the lead again and instead found his niche as a powerful supporting actor. 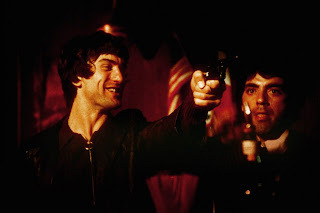 When De Niro is not stealing the movie with his young magnetism, Mean Streets flounders somewhat and features numerous scenes of the men posturing like peacocks and challenging each other's masculinity, often erupting into physical violence. The theme of repetitive reassertion for the overflowing testosterone does get tiresome. More interesting are the relatively few moments that focus on Charlie's relationships with Giovani and Teresa, who are both given relatively truncated treatment in the script co-written by Scorsese and frequent early collaborator Mardik Martin. Mean Streets is an unflinching drama set in the world of crude wannabe mobsters, a window to a world that is equally captivating and distasteful.